In Destiny, John William Waterhouse uses a familiar Pre-Raphaelite figure, the contemplative female, as the center of an ambiguous allegorical scene. A beautiful woman stands with a cup of wine to her lips, staring into the distance. In front of her, a book is lies open. Behind her, a large circular mirror dominates, reflecting her face and a view of the sea. The mirror has an interesting compositional effect. It drastically limits the depth of the scene and blocks the view of the room and of the natural space outside. However, it simultaneously serves as a sort of window because it shows a view of the world outside. At first, this scene seems straightforward. However, it is filled with inconsistencies and impossibilities. To start with, various details reflect an ambiguous attitude towards time. 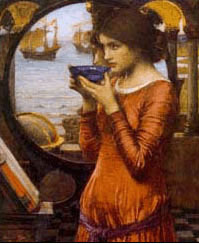 The round and shallow drinking cup looks Greek, and resembles similar cups in Waterhouse's Circe images. The architectural details include what appear to be Corinthian columns, which could be consistent with a classical Greek scene. However, the presence of a bound book implies a much later date. The ships and globe of the mirror-image also appear to be more modern than classical. The woman's clothing and hair style resemble those of Millais's Mariana, and they do not represent any clear historical period (certainly not a classical one). Furthermore, there are many spatial discrepancies. The woman is clearly indoors, in a dimly-lit space. The windows to the outside are behind her, beyond the mirror. How then would her mirror reflect the ocean? The top of a castle-like structure appears in the mirror, viewed from a height, but the landscape visible through the real portal to the outside shows that the structure is on ground level, in what appears to be a marshy area. Also, a globe that is reflected in the mirror does not appear in the actual room. It is clear the image in the mirror is not realistic. It represents either an unknown future or more likely a vision experienced by the woman with the cup. The title of the work, "Destiny," supports this reading. Waterhouse experiments with the use of circular mirrors in at least two of his other works, Circe Offering the Cup to Ulysses (1892) and "I am Half Sick of Shadows" said the Lady of Shallott (1911). In the Lady of Shallott image, the mirror acts very similarly, acting as a backdrop for a contemplative woman. It reflects parts of the interior scene, such as the lady's weaving, and also shows an impossible view of the outside. In the Circe painting, the composition is strikingly different. The central female, more active than contemplative, sits directly in front of the mirror. If the view visible in the mirror of Destiny is a vision and not a real reflection, why does Waterhouse also include a realistic reflection of the woman's face? Were Waterhouse's anachronistic details consciously chosen? Why might the artist have wanted to make his historical setting ambiguous? How does Waterhouse's Destiny relate to Dante Gabriel Rossetti's paintings of women and visions, such as Helen of Troy and Beata Beatrix? Is one artist's approach to representing vision is more effective? Why might Waterhouse have used the image of the circular mirror over and over? How do mirrors serve different purposes in, for example, Destiny (1900) and Circe Offering the Cup to Ulysses (1892)?